A crisis has clouded the hopes and dreams of both 3-year-old, Kulang, and the world’s newest nation. Oxfam Humanitarian Press Officer, Grace Cahill, shares the story of one family displaced to a UN camp in Juba. 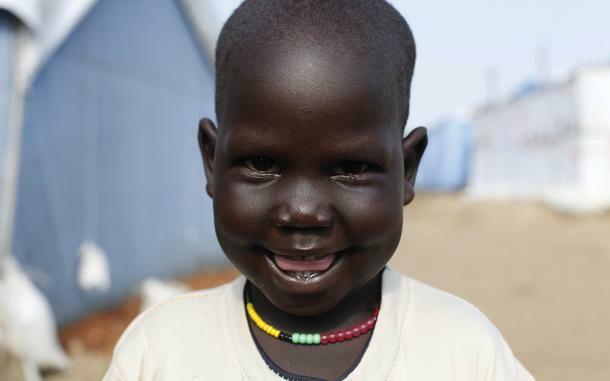 Kulang is 3 years old—born at the same time as his homeland, South Sudan. Like the world’s newest country, his life started full of hope and dreams. 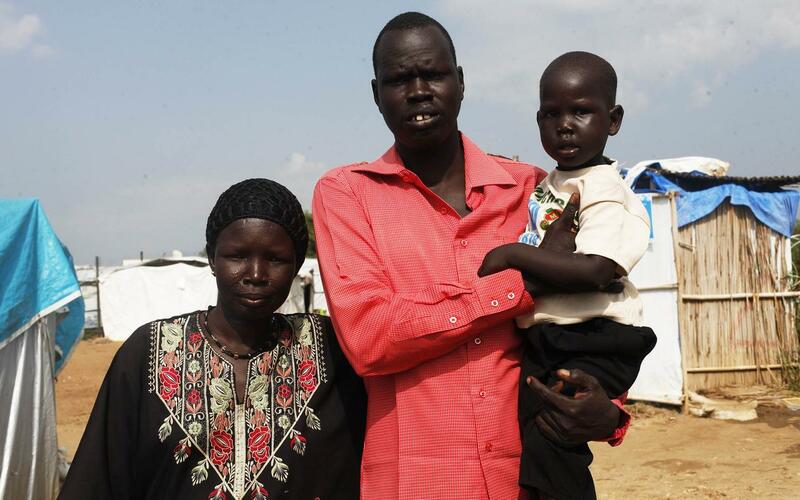 For Kulang’s parents, Elizabeth and Gatluack Choul, an independent South Sudan offered prosperity for their baby boy. But today the family, whose names we have changed for their protection, live trapped in a camp for displaced people while fighting rages across their new country. Their dreams have been shattered. Sitting high on the southern side of South Sudan’s capital, Juba, the camp is on the grounds of a UN compound and is guarded by armed UN peacekeeping troops. About 18,000 people live there, enduring frequent downpours and temperatures that soar into the high 80s. Three years ago Africa’s longest running civil war had finally ended. 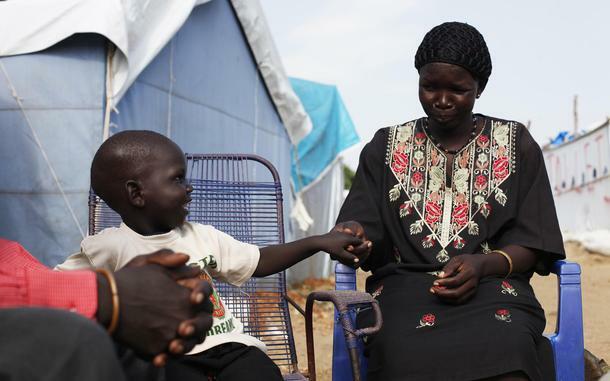 After decades of brutal fighting and bloodletting, peace had come to South Sudan. But then cracks started to appear within the ruling political party resulting in a falling out between the president and his former deputy. By mid-December last year, the argument had escalated into violence largely upon ethnic lines. More than 10,000 people have been killed. The events of the last seven months stand in stark contrast to the family’s experience of independence, marked this week on July 9. Three years ago, the country, and Kulang’s parents, celebrated for weeks on end. “Celebrations began from the referendum, then when it [independence] came, everyone was so excited. We were very happy because of that event. I remember me and my husband were very happy”, said Elizabeth. The family was living in the northern state of Unity at the time of independence and later moved 320 miles south to the capital with Kulang so Gatluack could find more work as a laborer in the construction industry. The couple left their other four children behind with relatives in their home state. 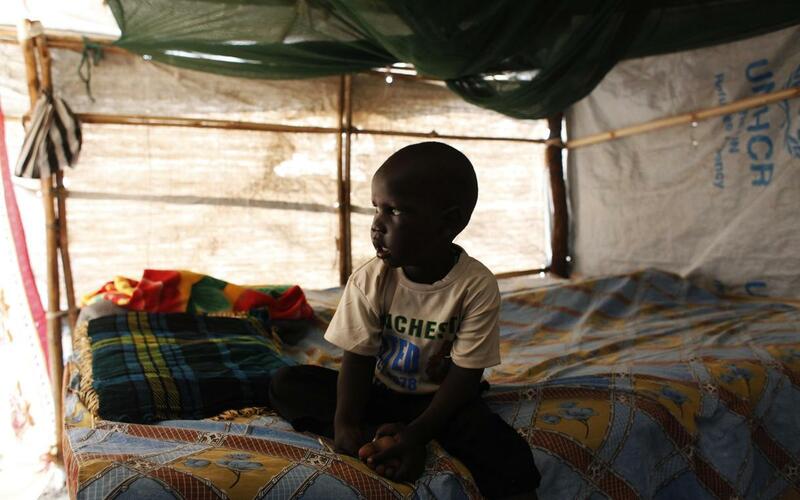 Having fled their home in Juba, Elizabeth, Gatluack, and Kulang are now living in a shelter made from a tarp, with only enough space for one bed. Elizabeth cooks the family’s meals outside on a miniature stove, using charcoal given to her by Oxfam and food by the World Food Programme. The family can never afford to supplement their rations with meat, usually just having plain starchy meals made using a grain called sorghum, which can give Kulang stomach problems. While Elizabeth cooks and cleans, Kulang will scamper about joining older children in soccer games nearby while Gatluack helps other families rebuild their shelters. There is a sense of calm in the camp now but the violence that erupted in the city last December is sharp in people’s minds. The family will not return home for fear of being targeted because of their ethnicity. The Chouls did not manage to take any belongings with them, only the clothes they were wearing at the time of the attack. They have since been given some small items, like a plastic table from friends, but say they need bedding, and Kulang runs about in a pair of trousers with holes. “I went home once,” says Elizabeth. “Armed men were in the house. They threatened me to sit down, tried to interrogate me. They said if you want to be alive, don’t come back here. Kulang’s parents wanted something different for their son. “I was thinking Kulang would lead a better life when he was born in independence, I thought he would have better chances,” says Gatluack. Kulang is bright and self-confident, known in the camp for bossing adults about and instructing them to play with him, especially his favorite game: soccer. The challenges for family life are clear. “Being a father is always about being able to provide for your son, sending him to school or a good hospital if he needs it. But how can you say you’re a father when you’re just sitting here?” asks Gatluack. “I am just ashamed of being a father here. The current conflict has displaced more than 1.1 million people and forced 400,000 to flee into neighboring countries. “It would be better if we didn’t have to leave to be refugees. The world needs to support people in their lives so South Sudan can be developed and there can be peace in this world,” Gatluack says when asked what he would say to people beyond South Sudan. South Sudan will require substantial humanitarian and political support from the international community beyond its third birthday and likely well into the years ahead. At present the UN appeal for aid to South Sudan is less than half funded. Oxfam has so far helped more than 260,000 people in South Sudan with food, clean water, sanitation, and cash distributions. As South Sudan’s families hang on to the hope of a better future, you have the power to help now.